Thomas Y. Cartwright is one whose name is practically synonymous with the Battle of Franklin. 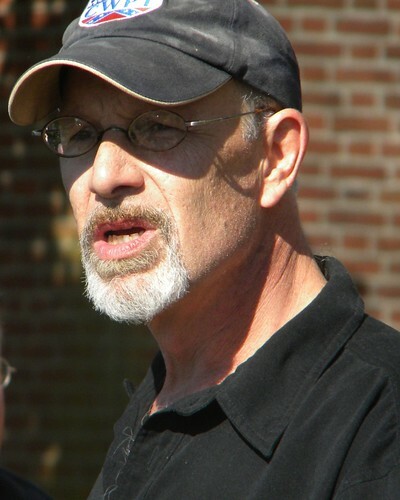 Former long time Director of the Carter House, Cartwright has been a frequent contributor to many Civil War film and documentary projects. In 2008, Cartwright stepped down from the Carter House to pursue his writing more. He recently locked arms with The Lotz House Museum in Franklin to help promote his walking tours of the Battle of Franklin. It is safe to say that no one knows the stories that have shaped the Battle of Franklin better than Cartwright. The DVD being reviewed – The Valley of Death – is a production of The Lotz House and features Thomas Y. Cartwright as the host for nearly one solid hour. 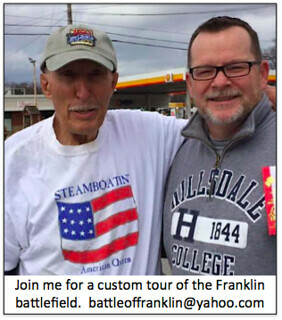 The best audience for this guide is not for the ‘beginner’ of the Battle of Franklin. I say that because Cartwright reels off names of commanders, generals, officers and units that flow effortlessly from his tongue, but that even challenge the serious student’s attention at time. His battle descriptions are not for the faint of heart. His depictions of the battle are at times horrific and gross, just like the real Battle of Franklin was. Cartwright does not use a script and yet his narrative flows smoothly most of the time. The DVD production makes ample use of reenactment footage from Battle of Franklin actions, many authentic period images, appropriate background music, and even some living history portrayals. It is fast-paced and filled with first-hand accounts of soldiers that Cartwright is famously known for sharing from his elephant-like memory. Here is a 2:32 excerpt from the DVD as Cartwright describes the action around the Carter cotton gin. The DVD could have been improved much if there were maps shown when Cartwright paints the picture of troop placements and movements. If you’ve never been to Franklin, or do not understand the topography of the field, you may find it difficult at times to get your bearings. The more versed student of Franklin will not have a problem keeping one’s place though. The Carter House and Cotton Gin sections get a combined film time of over 20 minutes, or 33% of the film’s content. This is expected knowing Cartwright’s background as former Director of the Carter House. However, the amount of time for some vignettes was just too short: Carnton (45 secs), Hughes Ford (60 secs), and the Lotz House (3:37). The inclusion of Hughes Ford, albeit brief, Fort Granger, and Rest Haven was nice. Many Franklin visitors might miss those sites if not pointed out by Cartwright. The vignette on Rest Haven Cemetery (3:40) includes coverage of the Unknown Franklin Civil War Soldier Memorial. It would have been much better in this section if the production included a sampling of some of the photos that were taken of that event in October 2010. Here is a link to a Flickr photo gallery from that weekend. The video below is not from the DVD, but was taken on site at the Carter House a few years ago when Cartwright still worked there. Cartwright’s command of the battle details and story is virtually encyclopedic. This is a resource that is a must for the serious student of the Battle of Franklin. The Franklin community is fortunate to have our own “Shelby Foote” and his name is Thomas Y. Cartwright. This entry was posted in Battle description, Cotton Gin, Preservation, Videos and tagged Thomas Y. Cartwright. Bookmark the permalink. There was a methodist minister serving as chaplain with the confederate army at Franklin by the name of E.M. Bounds. Was wondering if Mr. Cartwright ever made mention of him in his naratives? If so I would like to see it. To explain my interest, I serve as a chaplain in a reenactment group and Generel Ben Cheatham was my namesake and distant relative. 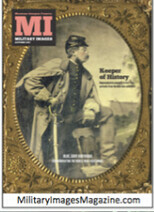 I have seen Mr. Cartwright on “Civil War Journal” and “The Battle of Franklin” from WideAwake Films. I admire his work and agree wholeheartedly with your comparison of him with Shelby Foote. county Tenn. and both at the battle of Franklin. Hi,I would like to know who owns the original copy of the photo of Gabriel and Edward Fowlkes who were both at the battle of Franklin. Is the original at the Carter House? I am wanting to speak with Mr. Dwain Knapp. I am a Fowlkes and would like more information on the photo of Edward and Gabriel. May I have contact information for Mr. Knapp?